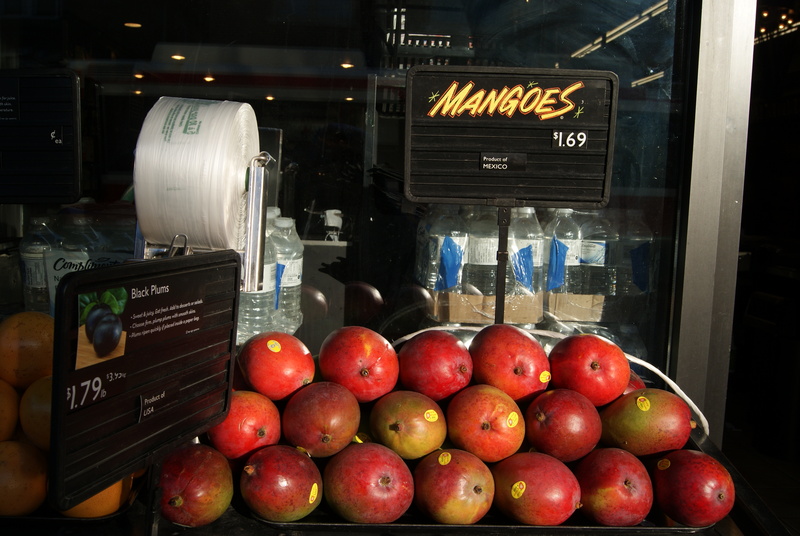 These tasty mangoes are displayed in a local shop. M is the thirteenth letter of the alphabet and the Roman numeral 1,000. M is the abbreviation for “Monsieur” [French], “medium” in clothing sizes, “middle,” and “Monday”. MA is the code for Massachusetts used by the US postal service. Other US postal codes include ME (Maine), MN (Minnesota), and MO (Missouri). An M-16 is a rifle. In contractions, the letter m stands for “my” in m’lord, for “am” in I’m, or for “madam” in yes’m. “Madam” may also be contracted to ma’am. Ma is a contraction of “mama” or “mother”. Miss is the form of address for an unmarried woman, Mrs or Mrs. (an abbreviation for “mistress” but now spelled out “missus”) for a married woman. As a compromise for women who choose not to reveal their marital status, there is Ms or Ms., pronounced “Mizz”. For men, Mr or Mr. stands for “mister,” the title assigned to ordinary men. It is also used to denote a man holding a particular office or, in a jocular way, a man with a certain characteristic. An MA or an M.A. is a Master of Arts degree. MD generally stands for Doctor of Medicine. As academic degrees, MD and M.A. are placed after the name. Look for additional abbreviations, acronyms, and codes that include the letter M.
Minnie Mouse minced more melons into the mix with mangoes. My Mazerati made a marvellous impression on the motorway. Note: This blog post is an excerpt from a book, English Manual: Letter by Letter, to be published in the fall of 2014.